Virtual Horse Racing News | Online Horse Racing Game: What is it? Online Horse Racing Game: What is it? If you have ever wondered what an online horse racing game is, why people would play, or how to play one then let us explain. Horse racing is a thrilling sport that can be enjoyed by just about anyone but what about being an owner or a trainer of these majestic thoroughbreds? The financial and / or fiscal investment required to be an owner or training in the sport of kings is a significant barrier for most people. 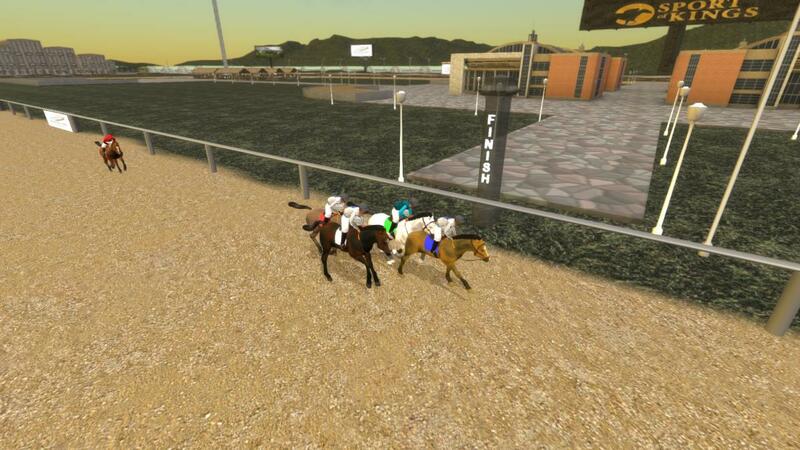 Our virtual horse racing game has removed that barrier and allow gives players of all budgets the chance to experience the thrill of owning, training, and racing virtual race horses. Sport of Kings is a hybrid simulation and mmorpg that gives players a chance to really evolve and improve not only their individual horses but their game play as well. Skill and effort are rewarded through seeing your horse in the winners circle and the prizes that come along with it! We work hard to ensure that our players have a fun and enjoyable experience playing our online virtual racing game. Our goal is to capture the excitement of real horse racing along with the ease of access of an online game. Player input is vital to the success of the horse and skill is the majority factor in determining long term success. Automated tasks help minimize the amount of time required to run a stable. Each season lasts 4 months meaning most horses can race every week. Race results are displayed in a format that any handicapper will recognize. Our championship series offers in excess of $10,000 per season in real money. The championship series consists of a series of qualifiers followed up by an invite only final. We offer six unique divisions for each age group including separate races for dirt and turf horses. The championship series is handicapped which means that it offers massive purses and the most level playing field you will find. Like no other we have incredibly detailed blood lines and realistic horse growth. Our virtual horses are uniquely modeled to act and grow like real life horses which allow for unexpected surprises to be had by even the savviest of trainers. Horses mature at different rates dynamically throughout their life. Our horses also exhibit specific race day tendencies that can be seen from the front runners to the deep closers. Trainers can influence that growth through their actions. Our platform gives players the chance to be anything from a full blown racing stable to a breeding only operation. We have players that simply love to handicap horses and have found a niche in picking up claimers who are improving and then selling them on the open market. You can even simply play a financial game with the economy and never enter a horse into a race! The possibilities are nearly endless and they will continue to grow as we do. We believe that Sport of Kings has created the perfect mix of realism accompanied with features meant to keep the game enjoyable. Our championships are winnable by even the smallest virtual stable and the prizes are growing each and every season. Online horse racing is able to be a 24 hour source of thrills and allows for global competition among horse racing enthusiasts. Come be a part of this growing game and help us shape the future of the horse racing industry.